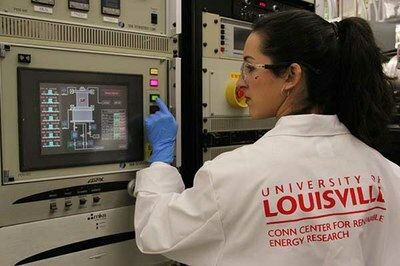 U of L’s Conn Center for Renewable Energy Research has shown solar energy can create clean hydrogen fuel by converting water vapor from the air. The Journal for Energy and Environmental Science recently published “Solar hydrogen production from seawater vapor electrolysis” by Conn Center researchers Sudesh Kumari, R. Turner White, Bijandra Kumar and Joshua Spurgeon. The article details a proof-of-concept system that could operate stably and efficiently at realistic conditions at the ocean’s surface. “This technology is also an important step toward providing personalized energy,” said Mahendra Sunkara, Conn Center Director. “Our solar fuels research team is making great progress towards durable technologies necessary for worldwide implementation”. This new clean hydrogen fuel is a true breakthrough, because although the sun isn’t always out to give solar energy, there is always humidity near the sea. Hence, there will always be water vapor in the air near coastal locations. This sustainable method will prove to be especially helpful for places with limited fresh water resources like California, which is forced to ration their resources. Their limitations could change into a surplus of energy with the Conn Center’s breakthrough. According to the team’s paper, this new technology is very attainable in the future and would be very beneficial both ecologically and to the scientific community.